flights that really stirred my imagination. The astronauts in that flight heard singing when they were in space, and no one had any idea where the singing came from. and how frightening as well. PRAISE THROUGH SONG is continuing out into the universe – forever. Praise God for that blessing. so blessed by the art and by our love for her that was expressed through Sandy’s creativity. the never-ending mystery of our worship of the Lord through music. I told her about NASA and the astronauts, and Sandy was also thrilled to consider all the possibilities of capturing this image through her art. One starry, clear night in 1993, I was standing on my patio, looking out into the night sky. It seemed that I could see deeper and deeper, farther and farther out into the universe. Then all of a sudden it was if the Lord spoke to my mind and said, “As far out into the universe as you can see, that is how deep into your heart I will go.” When I close my eyes, I can still see what I saw that night and hear HIS voice. if the scientists are right, our music is circling the universe as well! gratitude. – The center of the piece becomes whiter and whiter as though the Shikenah Glory of the Lord is present – some say that Shikenah Glory refers to cosmic power and presence of God.I thank the Lord for allowing us to sing for 25 years, to love HIM, to love one another, and to receive the power of the Holy Spirit through the times of worship we have experienced. May all who see this work of art be as blessed as I am this day. Who are the Glory Bound Singers?? The Glory Bound Singers are all members of the Daughters of the King in the Diocese of Texas. The group was founded with the intention of providing music for worship at the bi-annual assemblies of the Daughters of the King in the Diocese of Texas. 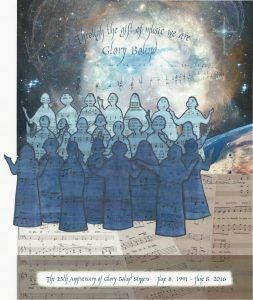 Founded by our past National President, Sharon Lundgren, and starting out with 12 intrepid singers and a few husbands, the group has grown to a membership of 50 Daughters representing 24 Episcopal churches in the Diocese and 2 Roman Catholic churches within the boundaries of the Episcopal Diocese of Texas. We are, principally, a ministry of and to the Daughters of the King in the Diocese of Texas. In 1997 our service to the Order was expanded to include the annual assemblies for Province VII of the Daughters of the King. Also in 1997, we had the privilege of providing the music for the worship of the Daughters during their historic return to the Church of the Resurrection in New York City at the close of the National Triennial Retreat in Philadelphia. In June of 2000 we provided the music for the Triennial Retreat of the National Order of the Daughters of the King in Denver, Colorado. We also provided the music for the Triennial Retreat in Minneapolis in 2003 and in Orlando in 2006. Each of the singers takes great joy in the gift of music and in watching the Holy Spirit pour out His blessings on the Daughters of the King through our musical offerings. We praise God for the anointing which he has given our ministry, and pray that He will continue to use our music to bless all with whom we come in contact. The Glory Bound Singers are Daughters of the King who, through the ministry of music, proclaim that Jesus Christ is Savior and Lord of the world. Guided by the Holy Spirit, we acknowledge that only through Christ’s divine intervention will the Church and the world be renewed, revived and restored to their original wholeness. Because Jesus is the Lord of our individual lives, we come together to sing to His Glory, and to encourage others in the joy of being in His presence. Visit here often for information about our next event.